In my spare time I’ve been messing around with oil painting recently, and one time-honored technique is that of the cartoon. Although its modern meaning points to animation, the term originates from the technique of inking a drawing as an initial paint layer. Since you paint oils in transparent layers that become increasingly opaque, this lets you put down initial layers, and once it’s dry you can still grasp the concept of the inked drawing through the earlier transparent layer, until finally it disappears. 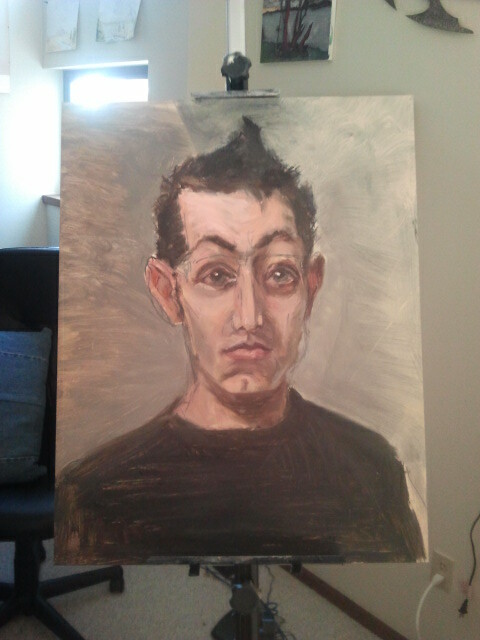 Here’s a self portrait I recently started. Among things I ought to have done with this initial layer include painting a monochrome grisaille rather than working in a variety of color (and arguably too much detail), but since I was painting on top of failed previous attempt I dove ahead, just to have fun and not waste a practice board. Because I still use drawing techniques as a crutch, I wanted to try methods of cartoon with a pen instead of a brush. I’m curious to see if it has negative results in the longevity of the painting. And if it’s eventually covered with opaque paint, is it possible nobody will notice? Are certain pens less damaging? Are some usable on canvass, some on boards? MANY earlier things I’ve tried failed to take to the art board’s slick surface. Indeed, it’s possible this pen only did so because it was painted on the failed oils of an older project. After a day of drying, since I was painting on a flat board (thus meaning brush strokes occasionally scraped through unpleasantly) I went in and blended certain edges, and buffed out some brush artifacts. I couldn’t do this the day before, but after a day of drying the paint was sticky and tacky, allowing for a finger to blend adequately. 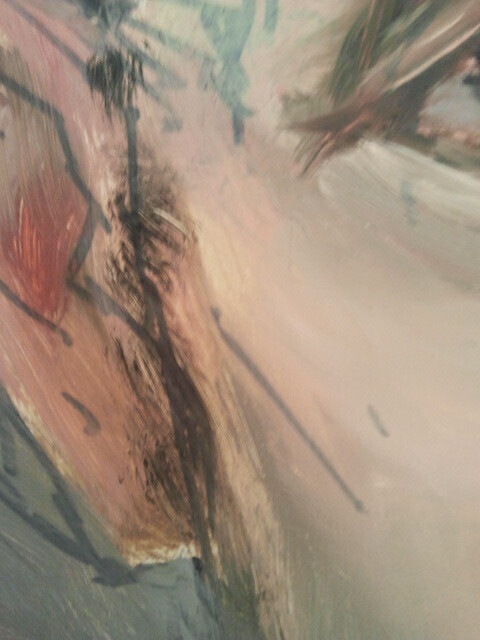 Had I done this the day before, a finger would have mopped paint away far too much, showing the failed painting beneath. But another side effect I noticed was worthy of note: As the paint dried, it became more transparent. Perhaps this means initial layers can be painted more opaquely without fear of losing your structural data. The day before this photo was taken, the cartoon was significantly less visible. i see your Oil Painting and i really appreciate ur work. . the portriate is really very good.